GOODBYE, ‘CHURCH’ COFFEE, HELLO CAFE NERI! There is no good reason why church coffee should be anything other than the best. That is why we are revamping and relaunching our hospitality after Mass. Cafe Neri is not like other cafes. In one sense it is not a cafe at all, but an extension of what we have just accomplished in Church; it is an ancient Christian sentiment that the Eucharist builds the Church, and as we have just celebrated the Holy Sacrifice of the Mass in Church, that Church-building continues when Cafe Neri opens its doors. In our open and friendly Parish Centre we serve good coffee and cakes because our people are important; we welcome everyone who comes through the door like long-lost friends, and we share in each other’s lives for a time. We will also now be serving Cakesmiths cakes. Hand-baked in Bristol and using only the finest ingredients, Cakesmiths’ cakes are some of the best around and won’t be beaten on quality and (most importantly) taste. There are no more poor quality biscuits at Cafe Neri, but beautiful cakes for people who matter. Do you think it’s “not my sort of fun?” If the thought of being stuck in a draughty church hall with a plastic cup of grey tea or instant coffee fills you with dread, then worry not. We serve lovely Bewleys’ drip coffee and Italian espresso with delicious handmade cakes just because you are important. More than that, our parish cafe is a place to meet others, spend time with one another and grow in fellowship and love of Christ - not by being preached at, but by meeting him in others. Hospitality is one of the greatest gifts we Catholics can share with one another, and as Saint Paul says, we might even entertain angels without knowing it. 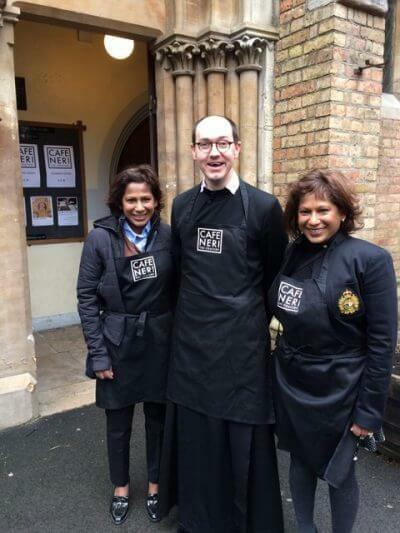 Come along this Sunday and see what Cafe Neri is about, let us share this hospitality with you, and let’s continue to build our parish community while eating cake.